George Keremedjiev is president of Tecknow Education Services, Inc., Bozeman, MT; 406/587-4751, www.mfgadvice.com. An intensive inhouse technical training institute coupled with the shadowing of shop-floor manufacturing technicians forms the backbone of skills training at Larsen & Shaw. Making money in metalforming is a difficult challenge. However, manufacturing remains one of the finest long-term money generators. Investors attracted to manufacturing quickly realize that patient capital and a willingness to wait for its growth, along with the development of a skilled workforce and investments in technology are among the top predictors of a stable internal manufacturing process. Metalforming is, of course, no different. Larsen & Shaw in Walkerton, Ontario, Canada, serves as our shining example. The family-owned manufacturer has grown to become a leading maker of world-class custom, standard, continuous and architectural hinges, related hinge components and other types of metal stampings. The vertically integrated company undertakes product and tooling design, tool build, stamping, assembly, plating, electropolishing, finishing, and global sourcing of materials. Management believed back in 2012 that Larsen & Shaw, at this stage of growth and with its nearly 100,000 sq. ft. of plant space and 100 employees, was due for a fresh look at its processes. Technology targeted included die protection, automated assembly, in-die part quality measurement and self-adjusting dies. Tying everything together would be implementation of company-wide enterprise-resource-planning (ERP) software. Employee technical training would be stressed to take best advantage of all of this new technology, especially the company’s new die-sensor program. 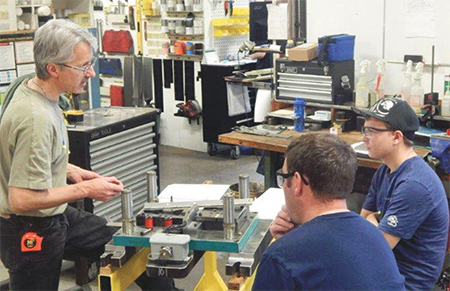 In-depth theoretical and hands-on die training for shop-floor personnel is a major component in the company’s drive to adopt new technologies such as die sensing and error-proofing. Bushell also stresses the importance of properly training new employees. 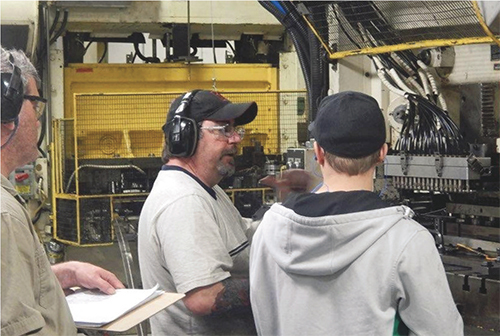 The company’s skills program involves a combination of classroom, online and hands-on training complete with competency assessments throughout the process. Larsen & Shaw has developed its own standard work, core and technical modules and has recently organized them into a formal training plan by work area. Skill sets are established upon successful completion in various phases. 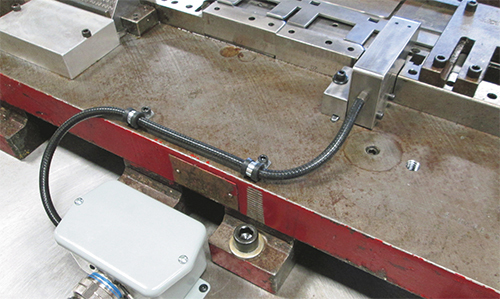 An existing die at Larsen & Shaw has been retrofitted with a feed sensor using best practices, including placement of a steel block to protect the sensor, robust conduit to shield the cabling from damage and a quick-die-change connector. Such training requires investment in time and money, but for Larsen & Shaw, results justify the expenditures. But what about the standard and most common model of training in North America, where new employees simply shadow more senior ones without any formal exposure to the theories and reasoning behind the operation of a given machine? It just doesn’t stack up, according to Bushell. Readers of my past columns and articles in MetalForming are quite familiar with the concepts behind and justifications of having a dedicated person to research and properly implement electronic sensors within dies and assembly machines. This individual has the title of sensor applications specialist, and at his or her disposal is a sensor laboratory − a special room for experimentation to ensure that a given sensor performs on the shop floor. Larsen & Shaw has such a program in place, achieving a level of excellence due in great measure to the company’s superb abilities to carefully perform experiments on the proper selection and implementation of sensors within its dies. Over the years, Larsen & Shaw had sensors on some dies, but did not institute a formal die-sensing program. After reading articles and columns in MetalForming discussing the benefits of in-die sensing and witnessing first-hand the damage and productivity losses resulting from misfeeds, the company took advantage of a complementary consultation visit to learn more, and has been on the error-proofing road ever since. The biggest hurdle, according to the sensor applications specialist I talked to at Larsen & Shaw, was arriving at the conviction that results will be there if you spend the money and time to pursue it. The first several months of the program, he explained, are going to be the most difficult in that you will not see many productivity gains. But if you hold course, make good judgments and implement and adapt to the technology as you learn it, you will eventually see and experience mounting program success. The program has truly arrived when the press operators no longer want to run any dies not equipped with sensor technology.